I hope you will be blessed by my creations. Some are just fun and feel good paintings and some contain messages from my Heavenly Father that I want to share with you. I was listening to Misty Edward’s song, “You Won’t Relent”. The chorus was the inspiration for this painting. 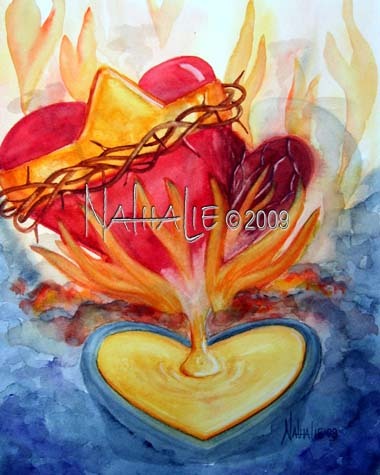 My old, broken, and scarred heart melted into His heart of love, purified and reformed. A new, pure heart, refined by His love. Come be the fire inside of me. Come be the flame upon my heart. Come be the fire inside of me. Until You and I are one. Prints are printed with archival pigment ink on archival quality paper for years of enjoyment. Copyright info as shown on the images are not on the paintings or prints. Original Watercolors on 140 lb. cold pressed paper, unmatted, unframed, shipped in clear protective sleeve.